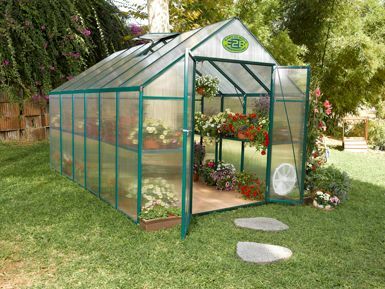 Now you can grow those garden vegetables or your beautiful flowers in this economical well built greenhouse. 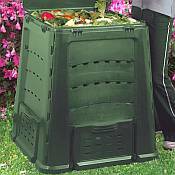 Spring will never end with this roomy greenhouse that is available in four different sizes. 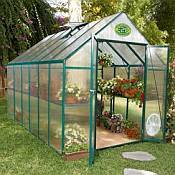 Whether you are a beginner or expert in plant growing, this greenhouse has many features to enhance your beautiful garden collection. The EasyGrow Greenhouse comes with everything you need to get your greenhouse up and running, hassle free. The Easygrow Greenhouse is 8ft wide, 10ft long, and 7ft 6 inches in height. The frame is made of heavy gauge extruded aluminum, beautifully painted a powder coated finish of Forest Green. The walls are made of 4 mil twin wall opaque polycarbonate. EasyGrow Greenhouses provide UV protection, excellent light diffusion, proper air circulation, heat control, and simple push-fit assembly that requires only a Phillips screwdriver and Pliers for assembly. The 8x10 EasyGrow greenhouse kit comes standard with double doors, circular side vents for proper air ventilation and roof vents with an auto opener for each vent. The greenhouse does not need to have a flooring as the construction of the green house has criss cross steel wires that make it very sturdy. You won't have to fuss with tracking changing temperatures in your greenhouse. The Automatic Roof Window Opener will do the work for you. changes using thermostatic control to provide consistent temperatures. 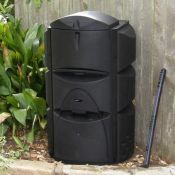 During periods with frost the cylinder should be removed to prevent damage. No Base neccesary Criss Cross Steel wire secures the framing. Easy to read pictured assembly instructions with push to click assembly. Tools Needed for assembly: Phillips Head screwdriver and Pliers. DOUBLE DOORS ON THE 8ft x 8ft, 8ft x 10 ft, and the 8ft x 12ft Greenhouse kits.